Everyone Can Learn to Skate! It's Fun!! *Our Spring 2019 Class Registration is closed. Please call Melissa (contact info below) to see if we have space for any late registrations. 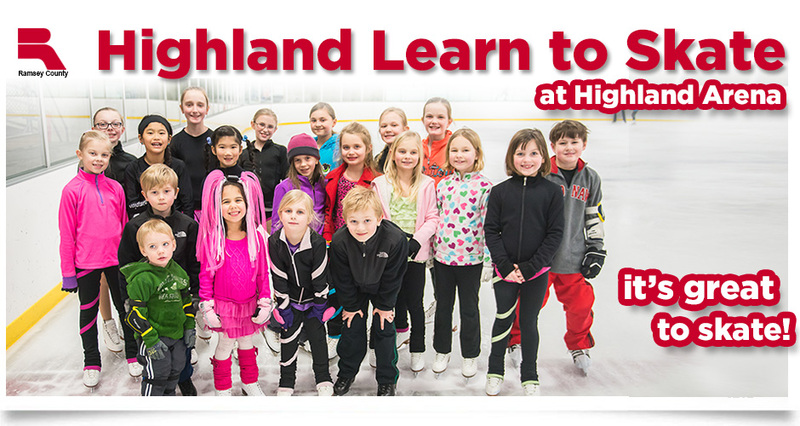 Highland Learn to Skate is proudly directed by the St. Paul Figure Skating Club. Classes are offered for all ages and abilities including: beginning level figure skaters, hockey players, pre-school age skaters, basic skill skaters and speed skaters! Each 8 week session of classes includes one 30 minutes lesson and a 30 minute practice each week. The Snowplow Sam levels are designed to help the preschool-age skater & skaters 6 and younger develop preliminary coordination and strength to maneuver on the ice. Skaters may be as young as 3 years old to begin Snowplow Sam classes, though they must be excited to skate, be potty-trained and are okay being away from mom and dad during their lesson. Fundamentals of the sport! These 6 levels of the program introduce the fundamental moves: forward skating, backward skating, stops, edges, crossovers, turns and Mohawks. Upon completion of the Basic 1-6 levels, skaters will have a basic knowledge of the sport, enabling them to advance to more specialized areas of skating. Classes will be 30 minutes with a 30 min practice time. Classes are for ages 7- 13 years old. Skaters who have never skated before or who have never taken a skating lesson before within this age bracket should sign up for Basic 1. These levels are the beginning levels to figure skating. Learn advance skating skills, spins, jumps and spirals. Skaters will work with their class coach to to design a curriculum for their class that works for each individual skater! Learn the fundamentals of Mini-Mites, Mites, and Squirts! Classes will work on enhancing power, speed, agility and good skating skills so skaters are successful in game situations. This class will also focus on learning proper skating technique, maintaining corrections and some time in class will be spent on stick handling. Please sign up for the level you've previously skated at, except for the Mini-Mites and Mite 1 level. There are multiple classes being offered at each half-hour segment to accommodate family schedules and the needs of the skaters! Please sign up for when your class time is offered and when it is convenient for you! A limited number of scholarship are available for eligible skaters. If accepted into the program, skaters will receive free group lessons and rental skates for one 8 week session and their own helmet to keep. These scholarships are meant for skaters who otherwise would never be able to learn how to skate without a scholarship. Please only apply if a scholarship is the ONLY way your child will ever learn how to skate. ONLY fill out the inquiry form if you are applying to the scholarship program~NOT if you are trying to register for regular classes. *Skater must currently be in the reduced or free school lunch program at their school. *The skater's will never learn how to skate without a scholarship. *Only applications accepted within these time frames will be considered: No Scholarships Available Currently. *Register for SPRING 2019 Classes Below! Learn to Skate USA is a collaboration between US Figure Skating and USA Hockey. Registration is just once per year and you first must register here before registering for classes at St. Paul FSC to meet insurance mandates. Once you register your membership will last through the end of May 2019. IF YOU REGISTERED WITH LEARN TO SKATE USA LAST YEAR, THEN THIS YEAR PLEASE "RENEW" YOUR MEMBERSHIP! Click on “Skater/Parent of a Skater." Fill out all information (it will take 3 min!) and pay the membership. Then log out or exit out. *The Fall 2018 classes are immediately below and then keep scrolling down to sign up for the Winter 2019 and Spring 2019 classes. *Sign your skater up for 1, 2, or all 3 sessions for the level they are currently at. If they pass a level, the Director (Melissa) will automatically enroll them in the higher level for the next session. Make-Up Classes: Please email Director Melissa (highlandlearntoskate@gmail.com) for your options to make up missed classes. Skaters enrolling in this class must have passed Snowplow Sam 2 or the equivalent. Skaters should be able to skate/move fairly well to be in this class. Skaters may be moved to a Snowplow Sam class if that is a better fit for them. Learn the fundamentals of Mites! Classes will focus on enhancing power, speed, agility and good skating skills so skaters are successful in game situations. Please sign up for the level 1st Year Mites if it is currently your first year being a Mite. Learn the fundamentals of Mites! Classes will focus on enhancing power, speed, agility and good skating skills so skaters are successful in game situations. Please sign up for this level if it's your second year being a Mite. Learn the fundamentals of Squirts! Classes will focus on enhancing power, speed, agility and good skating skills so skaters are successful in game situations. Please sign up for this level if you are currently a first year Squirt. Learn the fundamentals of Squirts! Classes will focus on enhancing power, speed, agility and good skating skills so skaters are successful in game situations. Please sign up for this level if you are currently a second year Squirt. For skaters 3-6 yrs old who have never skated before! For skaters who have passed Snowplow Sam 1 or the equivalent! For skaters who have passed Snowplow Sam 2 or the equivalent! For skaters who have passed Snowplow Sam 3 or the equivalent! For skaters 7-13 yrs old who have never skated or taken a skating lesson before! For skaters who have passed Basic 1 or Snowplow Sam 4 or the equivalent! For skaters who have passed Basic 2 or Snowplow Sam 4 or the equivalent! For skaters who have passed Basic 3 or the equivalent! For skaters who have passed Basic 4 or the equivalent! For skaters who have passed Basic 5! For skaters who have passed Basic 6! For skaters who have passed Pre-Freeskate! It's also recommended that skaters wear warm, easy to move in clothing. Snow pants & a winter coat work great! Anyone on the ice must be wearing skates-no shoes on the ice! Pros are available for private lessons. Please contact Melissa, and she will help you find a coach that best meets your needs!